While I meant her no harm in that moment, I never cared much for Barbie even as a child. I think even my 5 year old self knew there was something very wrong with the perfect image of Barbie: ever smiling, wearing all matching outfits, ridiculously proportioned, and looking for her perfect Ken so she could have the perfect kids and house and life. Looking back at the memory of holding her leg in my hand, I realize that I was learning an important lesson: Trying to be perfect all the time ends up breaking you, no matter how flexible or strong you think you are. If you have been trying to be flawless for too long - holding up an unrealistic image and schedule - and are reaching your breaking point, it’s time to rethink perfection and give yourself some unconditional love and support. Love your imperfection - it’s likely what makes you unique! 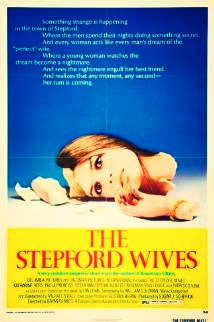 Remember that movie Stepford Wives? All the women were exactly the same, turned into robots who looked and acted like society’s image of a perfect woman. Watching the movie, it is obvious that having all women everywhere cater to one definition of “woman” is not only creepy, it is highly undesirable. However, after being fed a constant stream of air-brushed, cosmetically enhanced media images of the women we “should” be, it is far less obvious in our own day-to-day lives that we often strive to live up to a similar “perfect” or “normal” standard that would erase all that makes us unique. Worse, holding ourselves up to these so-called perfect images, we begin to hate aspects of ourselves that don’t seem to fit into this flawless frame. The more we hate ourselves, the more we attract negative, critical people and experiences to our lives, which makes us feel even more imperfect. If nitpicking at yourself is a habit, this will be very hard at first. Just be gentle with yourself and keep at it. Once you feel like you can send love to your eyes, it is time to send a little love to the rest of you. Find one part of your body that you dislike, and keep at it until the love starts to seep in. When you start to feel better about that body part, move on to the next one. Keep it up until you can honestly look at any part of you without feeling hatred, judgment, or criticism. This practice may seem silly. It may seem like too much work. It may seem too uncomfortable for you to do. Do it anyway. 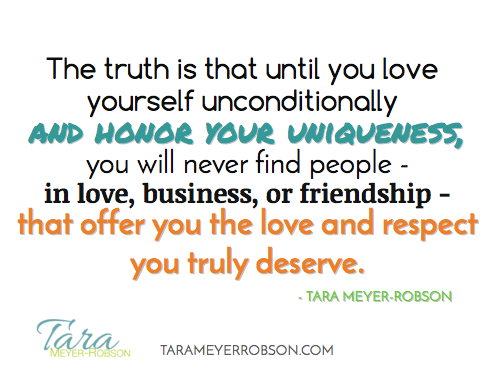 The truth is that until you love yourself unconditionally and honor your uniqueness, you will never find people - in love, business, or friendship - that offer you the love and respect you truly deserve. So, own your uniqueness fully. Look at it as the asset it is. 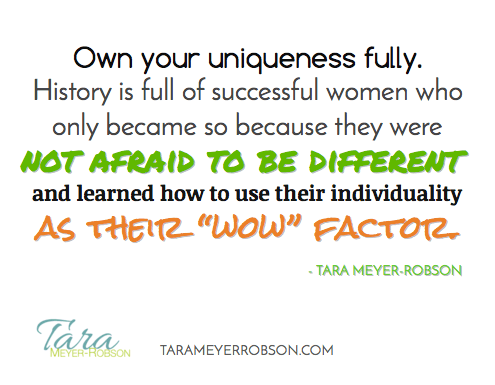 After all, history is full of successful women who became so because they were not afraid to be different from the norm and learned how to use their individuality as their “wow” factor. Be different. Be you. Love yourself. Stand out from the crowd. Be proud of your differences, and use them to become truly memorable! Best of all, when you embrace who are are and make decisions from a place of self-love then you won’t end up breaking, and isn’t that worth it in the end? For one hour of TV watching, write down any messages you notice that advertisers or media is putting forth on what is a “perfect woman.” Now, write up your list of how you define being a woman. How does your list differ from the media perspective? What do you hate most about yourself? Can you first remember when you decided that it wasn’t okay? What were the circumstances? Think about the words you use to criticize yourself. Are they the same words that you heard parents, teachers, coaches, friends, or other authority figures use to criticize you? Realize that there is no need for you to continue to believe that another person’s perspective on you is right. What is really different about you? Make a list. Then, think about how that uniqueness benefits your life. How can you use that difference, be it in looks or in how you see the world, to make yourself unforgettable? How about to benefit the world? How do you think your life would be different if you truly accepted and loved yourself? Quote Pics - Love them? Share Them! Never miss anything, and get 2 FREE healing meditations to boot ($29 value!). Sign up below and get inspiring tips and real change in your inbox once a week. Please note: I HATE spam and will never, ever rent, sell, or otherwise share your email with anyone. I will only send you once-a-week tips to help empower your life, and that's something that you can count on! Newer PostHow to Make Better Decisions: Why Happiness is the Best Compass of Which Direction You Should Go in Your Life.